The first-ever post on LucidSportsFan.com (actually LucidSportsFan.blogspot.com at the time) went live on Wednesday, March 2, 2011. The site has come a long way since the beginning. Earlier this year I noticed I was approaching 2000 blog entries, so I made a mental note to celebrate post No. 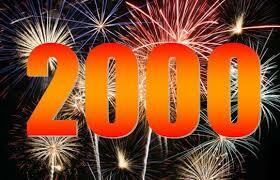 2000--but then I forgot. This is actually No. 2012, but I'm going with the fireworks anyway. Congratulations on your momentous feat!